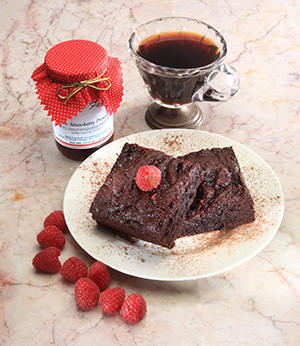 Freeze-dried raspberries and fresh raspberry jam give these cake-style brownies a deep and satisfying flavor of fresh fruit. All of our orders for Brownies, Cookies & Biscotti are baked to order and shipped fresh to you within hours of being removed from the oven on the date you choose. None of our "Freshly Baked" products are ever frozen or stored. However, we are closed on Sundays and cannot bake and ship on that day.